Walls Solero have two varieties of ice lollies out for this year’s summer. There’s the new Solero Mojito which includes actual rum! Yes that’s right, this is an adults only ice lolly! 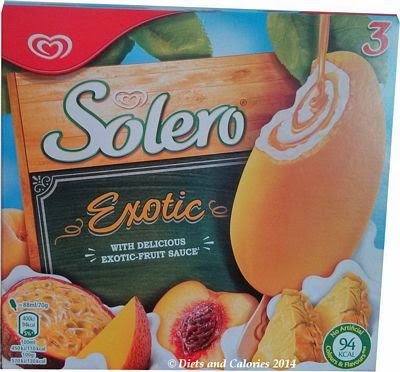 The other is a Solero Exotic, an ice lolly with extra fruit sauce. Being mainly water ice, the calories are low. The Solero Mojito has 55 calories and the Solero Exotic has 94 calories. 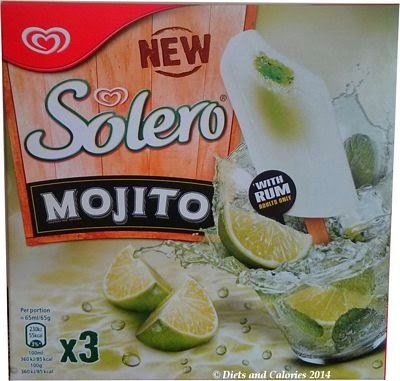 I was browsing an online supermarket website when I noticed the new Walls Solero flavour – Mojito. Since my husband is a cocktail fanatic, I just had to buy these. I also noticed the Solero Exotic Explosion (see review) which appears to have lost the 'explosion' since I last bought them. I buy the Solero ice lollies from time to time, mainly during summer and because they’re low in calories, but ultimately because my family love them. The Exotic ice lolly is described as ‘vanilla ice cream with a swirl of exotic fruit sauce (15%) coated with exotic fruit sorbet’. 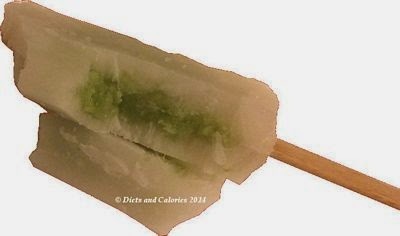 I don’t usually eat ice lollies, but I had to find out what the Mojito tasted like. The outside is a solid water ice with a refreshing lemon lime tang, while the rum is just about detectable as an undercurrent - you're not going to get drunk eating these! The inside is quite unusual. It’s a lime green colour and soft, like ice cream but with a texture like desiccated coconut, which is actually the lime pulp. The whole taste together is incredibly refreshing and thirst quenching - ideal for a hot day. 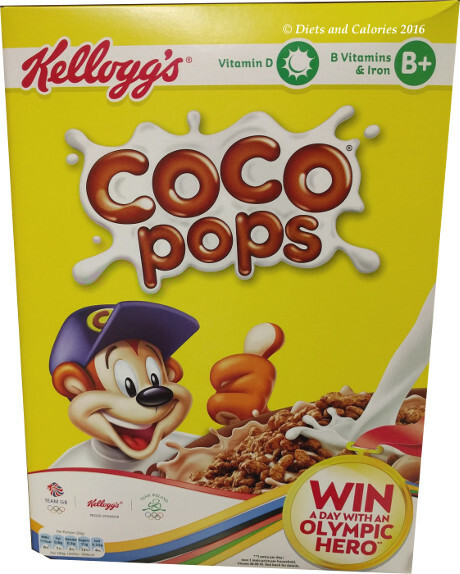 On the bad side they contain high amounts of sugar in the form of glucose fructose syrup and sugar. But the good side is they’re low in calories, fat, sat fats and salt. The Exotic variety is gorgeous. The outside is a very sweet, fruity mango water ice which is delicious on its own. 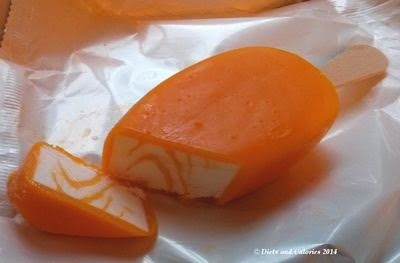 The ice cream inside is soft and creamy and with swirls of sweet, exotic puree running through the middle. It's like heaven on a stick. 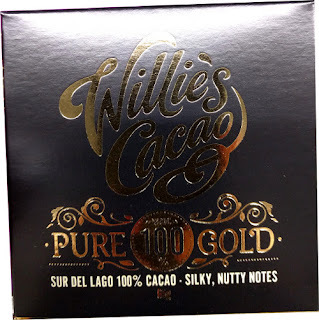 The whole combination makes you feel as if you're eating a dessert on a stick. I can see why they’re so popular. 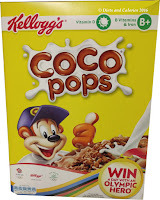 Again, high levels of sugar and a slightly higher calorie count (they are bigger/heavier too). But for under 100 calories, Solero ice lollies taste like a much higher calorie indulgent treat. I only wish there were more in a box as three are gone in one night and someone is always left out in my house! Available in most supermarkets in boxes of three and also individually in some outlets. Nutrition Information: Solero Mojito (65ml): 55 calories, <0.5g protein, 20g carbs, 12g sugars, <0.5g fat, <0.5g sat fat, <0.013g salt. Nutrition Information Solero Exotic (88ml): 94 calories, 1g protein, 20g carbs, 17g sugars, 1g fat, 1g saturates, 0.05g salt. Ingredients Solero Mojito: Water, Sugar, Lemon Peel Pieces (5%), Glucose-Fructose Syrup, Lime Pulp (2%), Lemon Juice from Concentrate (2%), Lime Juice from Concentrate (1.5%), Rum (0.5%), Acidity Regulator (Citric Acid), Stabilisers (Locust Bean Gum, Pectin, Xanthan Gum), Flavourings, Colours (Copper Complexes of Chlorophyllins, Curcumin), Natural Mint Flavouring with Other Natural Flavourings, Alcohol content: 0.298% v/v, 1. Contains rum, for adults only. Ingredients Solero Exotic: Reconstituted Skimmed Milk, Water, Sugar, Peach (7%), Passion Fruit Juice (7%), Mango Puree (6.5%), Pineapple Juice from Concentrate (6%), Glucose-Fructose Syrup, Glucose Syrup, Coconut Oil, Whey Solids (Milk), Stabilisers (Locust Bean Gum, Guar Gum, Carrageenan), Colour (Carotenes), Emulsifier (Mono- and Di-Glycerides of Fatty Acids), Acidity Regulator (Citric Acid), Flavouring, Ice Structuring Protein, Gluten Free.